Join us for this annual event designed to get young children excited about reading. 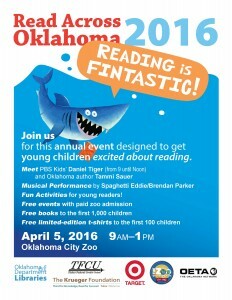 Meet PBS Kids’ Daniel Tiger (from 9 until Noon) and Oklahoma author Tammi Sauer. Musical Performance by Spaghetti Eddie/Brendan Parker. Fun Activities for young readers! Free events with paid zoo admission. Free books to the first 1,000 children. Free limited-edition t-shirts to the first 100 children.